Now a note from the California Environmentalist in me . . .
Several years ago I read about an effort in California to stop the use of plastic drinking straws in restaurants. From what I remember activists were going to restaurants in their towns asking them not to give out plastic straws with every drink. I forget what percentage of restaurants joined this voluntary movement. But it did have small, local success. Thus began my personal campaign against straws. I do not take a straw when I buy a drink. I return straws that are automatically given to me. Sometimes I even tell the wait staff not to bring straws. Now my friends are hearing about my little bit of activism. So far I doubt I have made a major impact. But I have made a personal impact. Neither hubby or I accept a straw at restaurants and we go out several times a week for either lunch or dinner. (By the way the national average is 4 meals out a week.) This picture was from dinner Wednesday night. Not only was I given a straw, it was also wrapped in plastic. 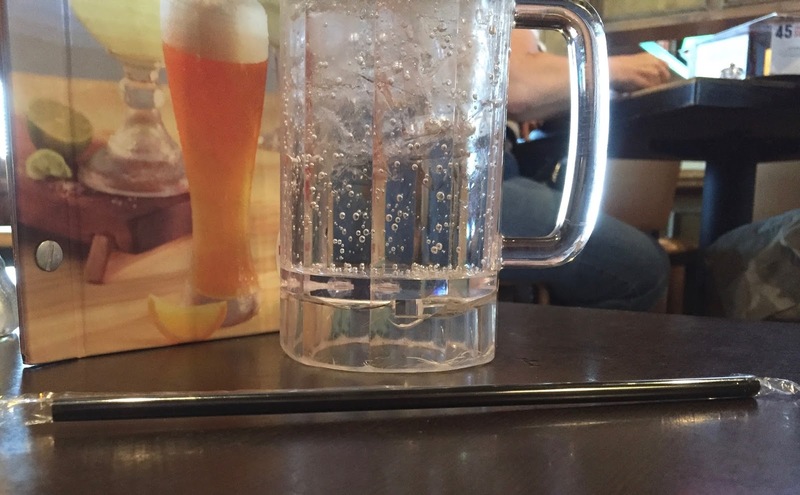 Hum, if we didn't use straws like this we could save on both items. So why are we anti plastic straws? Plastic is a major trash issue and environmental hazard. Here's an ICK for you: a lot of plastic ends up in the oceans. Take a look at Straw Wars: The Fight to Rid the Oceans of Discarded Plastic published by National Geographic this week. As author Laura Parker says "...straws have become one of the most ubiquitous unnecessary products on the planet." I definitely agree with that. There are times when straws are helpful, but they don't need to be an-every-drink item. Aside from washing up on beaches and looking bad, straws and plastics are damaging to animals that live in the oceans. They don't realize that straws and other plastics are not edible. So, they try to eat them. Sometimes they succeed, sometimes they don't. Instead they get the plastic caught around body parts. (Remember Mumble from the movie Happy Feet? He wore 6 pack rings around his neck.) If the plastic makes it to their stomachs it doesn't degrade. This impacts larger animals who might feed on them. And, ultimately, we humans will be eating fish who had plastics in their food chain. Another ICK -- plastic is made from petroleum. Now doesn't that sound appetizing? The next thing to note is it takes a really long time for any plastic to degrade. And, when it eventually does it releases toxins into the air and/or water. Don't you want to be a sea turtle living in an area where toxins from plastics are being released? Or maybe a small sea bird. Not likely. Now what can you do to stop the production and use of 500,000,000 million straws a day? (One Green Planet) Yes, five hundred million straws made in a day worldwide. And this is for a single use product we don't even need. Stop taking straws in restaurants and fast food locations. Stop buying straws. Tell friends and neighbors about the need to stop adding to our plastic pollution by using straws. This may not sound like it will be a really big help, but it is a start. If we could quit accepting straws unthinkingly, imagine of how much better our environment would be. I am a native Californian and lived there off and on during my growing up years, went to college there and started my marriage and family there. I became much more conscious of waste, recycling and the like while I lived in Ca. Pat and I have recycled for years, we had a large solar array with our house in Powhatan that provided about 75% of our energy, and we now have a hybrid electric car. We do take helping Mother Earth seriously. Join us in our anti-straw campaign. Take some time to read some of the articles I've linked to above. It is truly eye-opening. Every decision to not use straws helps. Let me know if you want to join in my no-straw effort. It's probably one of the easiest actions you can take to help our own environment. Phew, I'm getting off of my soap box now. But, don't be surprised if I bring this up again in the future. had never thought of straws in that way. I like to use a straw when I eat out because it seems like the ice is forever causing a splash when I go to drink - usually all over my face or down the front. We do not eat out often, maybe once a week and sometimes not even that. Also a straw in a drinking cup in the car is so convenient with the covered lid but yes you could pour your cold drink into a covered coffee mug instead and would probably stay cold longer. I live in a small town/country area I guess we do not accumulate near the trash that California does - but yes it all adds up eventually. Something to think about! I read the National Geographic article. The photo of the surfer amid the garbage spoke volumes! It's been years since I've seen a paper straw, but I know they are still made. And then there are those of us who "choke" without a straw - actually prescribed by a physician for both myself and my granddaughter. I have seen her drink with a coffee stirring stick because she ends up with pneumonia when she aspirates which she does every time she tries to drink out of a glass or bottle. We have non-disposable straws at home, but please don't brand us as unresponsible because we drink with straws. Interesting! Due to reconstruction of our water-damaged kitchen, we have been eating out a lot, and I have wondered why it is more desirable to sip from a straw --I don't at home. But, I had not gone any further with the thought. Thanks for bringing this to my attention. I am up and mobile; I surely don't need a straw to sip my drink. I have avoided straws for years. (Though not with milkshakes.) Plastic waste is everywhere -- even here in the Great Lakes. We don't use the straws either for water and other drinks. Only in milk shakes.